Maryland soldiers have played a decisive role in American history since the establishment of the first European settlement in Maryland at St. Mary’s in 1634. Among the 250-odd adventurers who disembarked in the new land on 25 March 1634 were two militia captains. 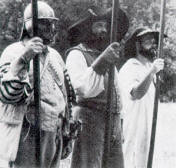 Although all able –bodied male Marylanders were obligated to serve in the militia, the captains called upon volunteers to establish a professional armed force known as the “trained bands”. A nightwatch guard was set up immediately. 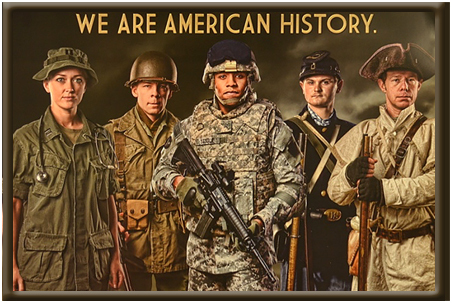 The Ancestors of the Maryland National Guard has taken root in America. The Annapolis Assembly called for the revitalization of the Maryland militia, which had lapsed since 1763. One group that responded to this call was the “Baltimore Independent Cadets,” a volunteer unit established on 3 December 1774 by a 31-year old merchant named Mordecai Gist. The 60 original members of this unit were wealthy enough to buy their own uniforms and were intent on learning military drill on a par with British regulars. Today’s 175th Infantry Regiment of the Maryland Army National Guard traces its origins directly to Gist’s company. The first duty performed by the Maryland militia in the War of 1812 was to protect the publishers of an anti-war newspaper from an angry Baltimore mob. By 1813 the British ships raided up and down the length of the Chesapeake Bay with orders “to destroy and lay waste such towns and districts upon the coast as you may find assailable". By August, the British had marched on to Washington D.C. via Bladensburg, Maryland’s 5th Regiment made a valiant stand but was forced to retire in a haste when General William Winder’s little army gave way. The British proceeded on and the capital was promptly plundered and burned. General Robert Ross was most likely to move on Baltimore next, so the Marylanders worked feverishly to prepare the city’s defenses. 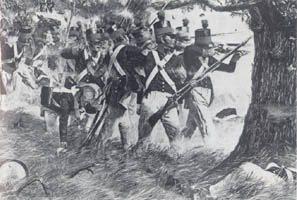 Fort McHenry guarded the direct approach to Baltimore up the Patapsco River, so on 12 September 1814 Ross decided to land 5,000 troops at North Point (present-day Fort Howard). He then planned to attack the city from the east, meanwhile a secondary attack by Admiral Sir John Cockburn’s warships against Fort McHenry would test the American Patapsco defenses. 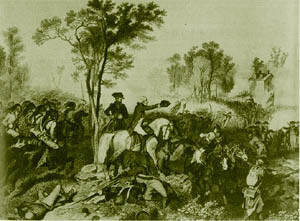 By 13 September the British pursued, but halted the advance when they realized that the American position was too strong to storm by direct assault. Cockburn’s sailors and marines discovered that the water approach to Baltimore was too formidable to crack. They bombarded Fort McHenry for 25 hours, lobbing more than 1,500 shots, shell, and rockets in and around the bastions-all to no effect. On 14 Sept 1814, Cockburn’s warships gave up and retired down the Patapsco, the British land forces retreated to North Point, embarked on their transports, and sailed down the Chesapeake. For Maryland, the War of 1812 was over. Francis Scoot Key’s Star Spangled Banner describes the “perilous fight” at Fort McHenry. In May 1846 US Army recruiting offices in Maryland were jammed after the United States had declared war on Mexico. 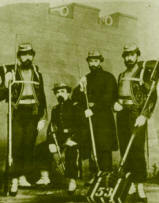 Individual Marylanders from the volunteer militia did serve, however, especially in the Battalion of Baltimore and District of Columbia Volunteers, which was accepted by the federal government for service in June 1846 Under the command of Lieutenant Colonel William H. Watson, a former captain in the Independent Blues Company of the 5th Maryland. On 12 April 1861,the Civil War erupted. Many Marylanders were reluctant to take up arms against sister states. Many Maryland militiamen, particularly from Baltimore’s 5th and 53rd Regiments, went south to fight in the Confederate Army and formed the 1st Maryland Infantry (CSA) at Harpers Ferry in May 1861. While some 20,000 Marylanders chose to fight for the south, 48,000 citizens of the Old Line State served in the Union Army. The most famous Maryland regiment in federal service was the 1st Maryland Infantry (USA). Confederate forces attacked the Union 1st Maryland at Front Royal Virginia.. During the battle, Colonel Kenly inspired his men to keep fighting even though escape was impossible. The motto of the 115th Infantry in today’s Maryland Army National Guard sprang from Colonel Kenly’s cry of” Rally Round the Flag!” at Front Royal. Six infantry regiments of “U.S. Colored Troops” were raised in Maryland after Lincoln’s Emancipation Proclamation in January 1863. Of the sixteen blacks that were awarded the Congressional Medal of Honor during the Civil War, five were Marylanders. In 1865 the War came to a end with the surrender of Robert E. Lee. On 26 July 1917 The 29th Division was activated for war, it gained its soon-famous nickname, the “Blue and Gray Division". After nearly three-quarters of a year training and additional recruiting, the 29th Division finally set sail for Europe in June 1918. By the end of July, the 29th Division was in the trenches in the Alsace region of France, the southernmost American unit on the Western Front. The 29th remained in the line for almost two months, suffering 744 casualties – more than any other American division in the Alsace sector. In late September 1918 the 29th moved north to the Meuse- Argonne sector to participate in the largest American offensive of the war. The 29th role in the offensive began 8 October when it advanced up the east bank of the Meuse River against a strong German position . 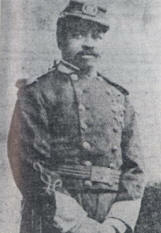 The 115th Infantry, commanded by Colonel Milton A. Reckord, led the 29th Division’s attack. The 29th Division’s assault continued intermittently for three more weeks, driving the enemy back another half of a mile. On 11 November 1918 the day World War One ended the 29th Division was in reserve waiting to re-enter the trenches for another big offensive. The 29th was kept in fighting trim for several months. 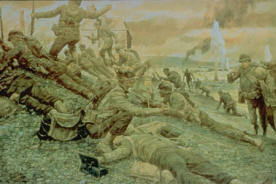 In April 1919 the Blue and Gray Division at last departed France for home. A Maryland National Guard outfit that experienced a totally different war was the 1st Separate Company, otherwise known as the Monumental City Guards. Originally this African-American unit was supposed to be included as an integral element of the 29th Division, but in March 1918 it was shipped to France and assigned To the 372nd Infantry Regiment as Company I , an element of the all-black 93rd Division. 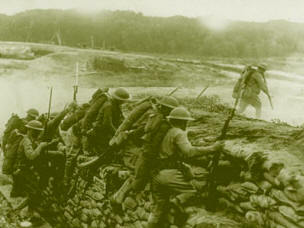 The 372nd Infantry fought with the French Army’s IX Corps for most of the War, including the great Meuse Argonne offensive. Baltimore native Sergeant William Creigler of company I earned the French highest military decoration, the Croix de Guerre, for his heroic leadership of the unit after his company commander had been wounded. For its distinguished World War One service, the company itself was awarded the prestigious French Croix de Guerre with Palm. On 6 June 1944 (D-Day) the 29th Division joined forces with the 1st Division to assault Omaha Beach. In the 29th Division’s sector, Virginia’s 116th Infantry supported by the Maryland National Guard’s Company B, 104th Medical Battalion, landed in the first wave and met unexpectedly heavy resistance from the German troops entrenched on the bluffs behind the beach. Despite enormous losses, the 29th bravely penetrated the enemy defenses and established a tenuous beachhead. Although much of the fighting still lay ahead, the 29th Division’s triumph on Omaha Beach was a critical turning point in the World War II history, Within a few months, the great armies of democracy, consisting of millions of men, would land in France across the beaches of Normandy and press the Nazi armies back beyond the Rhine. On 25 June 1950 North Korea invaded South Korea and President Truman ordered federalization of selected National Guard units. The only Maryland National Guard unit to be called to active duty during this period was Baltimore’s 231st Transportation Truck Battalion, which had formally been known as the 1st Separate Company (Monumental City Guards). This unit helped rectify a severe shortage of experienced truck drivers and reliable vehicles in the U.S. Eighth Army in Korea. At that time the military situation was highly fluid, and the drivers were frequently required to bring their trucks right up to the front lines to keep the infantry in full supply. The Marylanders remained on active duty in Korea until February 1955 one and one-half years after the end of the Korean War. Brought other changes to the Maryland Guard, including expansions in unconventional warfare units. Maryland became one of the first states to create an Army Special Forces unit when Company B, 16th Special Forces Group stood up in Towson in 1963. This complemented the Maryland Air Guard’s 135th Air Commando Group, which had been in existence since 1955. Other changes including the inactivation of the famed “Blue and Gray” 29th Infantry Division in 1968 as part of a National Guard reorganization. The 29th Division would not be brought back to active status until 1985, when it was reorganized as a light infantry division, in recognition of the Army’s need to have forces that could be deployed quickly and fight in difficult terrain. Social unrest at home also kept the National Guard busy. Simmering racial tension in Cambridge, Md., kept the Guard on duty there for nearly the entire decade of the 1960s. Likewise, repeated antiwar riots at the University of Maryland resulted in multiple deployments to the campus into the 1970s. Perhaps the National Guard’s biggest test came in 1968, following the assassination of Dr. Martin Luther King, Jr. Across the country rioting broke out, and the city of Baltimore was no exception. Nearly the entire Maryland National Guard was deployed to contain the disturbance. Ultimately the Guard was federalized and reinforced by active Army troops before the rioting subsided. The Maryland National Guard’s final federal call-up of the Cold War came shortly after the Baltimore Riots ended. On Sept 1990 The United States called up the largest deployment of American ground troops since the Vietnam War. Maryland National Guard soldiers and Airmen were among the 49,000 Reservist and Guardsmen activated for the Middle East Crisis. On January 16 1991 the 200th & 290th Military Police Company were called up to serve in Saudi Arabia. As part of the 400 Military Police Battalion they were task to guard Iraqi prisoners. Also performing active duty within the theatre was the 1229th Transportation Battalion and the 29th Air Traffic Control Group. In February 1991 the 1st and 2nd Special Forces Battalion’s Company B & C were called up for Operation Desert Storm. A total of nine Maryland National Guard units were activated during this war. The terror attacks of 11 September 2001 have brought the largest and most sustained call-ups of the National Guard since World War II. The 115th Military Police Battalion mobilized and on 12 September was ordered to help secure the Pentagon attack site. Elements of this unit would go on to serve in Afghanistan, Iraq, and Guantanamo Bay, Cuba. Since then, nearly every unit of the Maryland National Guard has served overseas in Uzbekistan, Pakistan,Kuwait or elsewhere. In 2007, elements of the 58th Brigade Combat Team, including the 175th Infantry and the 158th Cavalry Regiments, were deployed to Iraq, the state’s the largest single mobilization since 1968 and its largest combat deployment since World War II. When Hurricanes Katrina and Rita struck the U.S. Gulf Coast in 2005, the Maryland National Guard deployed some 13 separate task forces to the region and flew numerous relief missions into the area. The Katrina mission was but one of many humanitarian relief missions the Maryland National Guard has participated in over the years, both at home and abroad.